Prior to his last visit abroad, Laurens commissioned a miniature portrait (now privately owned) from Charles Willson Peale. Laurens probably took the miniature with him in the fall of 1780 as a gift for his wife, who was living in France. 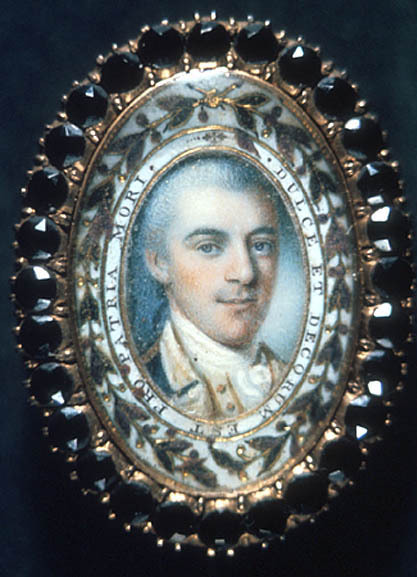 Later, Peale copied the miniature for one of Laurens's comrades, Major William Jackson, apparently as a postwar memento of their joint service during the siege of Charleston. The copy miniature bears the Latin motto, ;Dulce et decorum est pro patria mori” ("It is a sweet and honorable thing to die for one's country"). Given to the City of Philadelphia by Ann Willing Jackson, daughter of Major William Jackson, in 1876.
aurens was born in Charleston, South Carolina, on 28 October 1754. He went with his father to England for his education, attending the University of Geneva for two years, and then London's Middle Temple for legal studies. Early in the war, he returned home to America, becoming General George Washington's aide-de-camp in the fall of 1777. Laurens fought at Brandywine and Germantown, wintered at Valley Forge, and was injured in the Monmouth campaign. In 1779 he returned to South Carolina for service in the state legislature. He was captured during the British siege of Charleston and, after his release, went to France in order to assist Benjamin Franklin with the task of raising funds for the Continental Army. Returning to the war a few months later, Laurens fought at Yorktown and was killed on 27 August 1782 at Combahee Ferry in South Carolina.